Most of us would have some awareness that posture is important. However, perhaps not releasing just how important. The long term implications of habitual poor posture can have profound effects on body structures such as joints, ligaments, muscles and spinal discs. Good posture entails holding the body in a position that aligns the center of gravity, meaning no one structure is taking excessive load and becoming overstressed. The same laws of gravity apply to our bodies as do buildings. If a building is constructed with a poor foundation then it is less resistant to the strains and stresses placed on it. Our body is much the same. If we are running, jumping, walking, or even sitting and standing with poor posture those external forces are being transmitted through the body structures unevenly, loading up certain areas more than others. The long term effect is degeneration, structural changes and often pathological changes and pain. 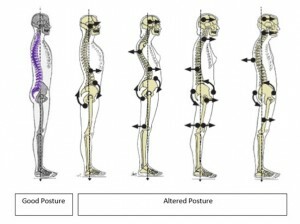 To understand how less than ideal postures can lead to these changes, it may help to break down some of the flow on effects. Muscles will adapt to demand. Muscles that are held in a shortened position overtime will reduce in overall length and often progressively weaken. Other muscles will have to work harder to hold the body upright against the change in center of mass, meaning they become overactive, increasing in tension. This tightening can then cause additional compressive forces on the joints or the spinal column that they surround. The end result is imbalance, causing the spine and joints to operate in altered mechanics resulting in sheering, rubbing and compressive forces acting on body structures. Overtime this can lead to break down and degeneration, pain and dysfunction on the way the body moves and operates. It is all well and good to tell you about the impacts of poor posture, but what is more important is what can be done to improve it. This is where Pilates can help. Pilates is a gentle exercise that stretches and strengthens muscles, improves postural control and alignment, without straining the heart or joints. SportsMed NQ runs several Pilates classes through the week including a posture class on a Wednesday morning at 9.30a.m. This class has a focus on improving postural awareness, stretching and strengthening common muscles that are affected by poor posture. Encouraging good postural awareness not only in static positions such as sitting and standing, but also during dynamic activates such as walking, lifting, or reaching out to pick something up. By integrating improved postural control into movement patterns, this then overtime translates to habitual postural changes in everyday life. When your body is in alignment and your weight is balanced, your muscles require minimal effort to support you and your weight is evenly distributed over the intervertebral discs, avoiding excessive stress on ligaments and joints. Carrying out your day with good postural alignment will allow you to work more efficiently with less fatigue. Being more aware of your posture and how to improve is the first step to breaking habitual poor postures. By making the changes now you may be able to prevent structural anatomical changes that can develop, possibly reduce posture related headache, aches and pains, assist in minimizing effects of poor posture on complaints such as lower back, neck, foot, ankle, hip, knee, and shoulder pain and their associated conditions. Please call 4771 3650 to book into to one of our classes and get yourself on the road to improved posture today.